If A "10" Exists This Boat Is It! Fresh Water Use Since New Only Two Fussy Owners Since New MerCruiser 496 Mag MPI HO Engines Rated at 425 HP Fresh Water Cooling Only 265 Hours!! 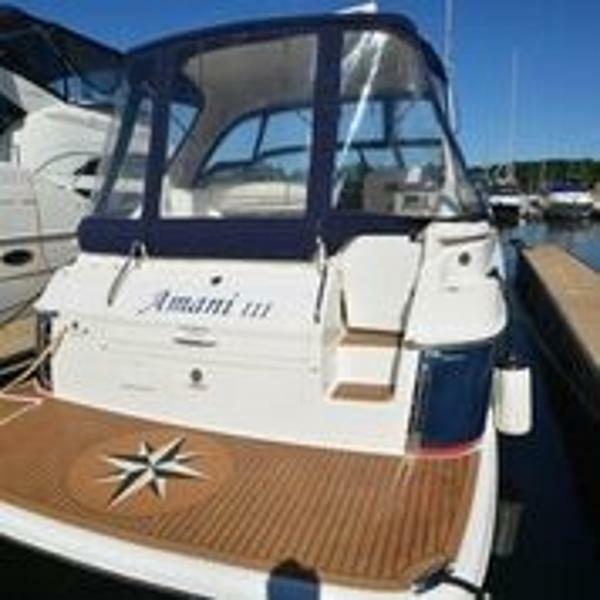 V Drive Transmissions Bow Thruster Sought After Hardtop with Like New Enclosure Full Electronics Package Includes GPS-Chart Plotter-Radar, Autopilot, Stand Alone Depth Finder, VHF and More! Generator With Under 300 Hours and Sound Shield Salon and Galley Teak and Holly Flooring Teak on Swim Platform and Cockpit-Looks Great! Wow, it is hard to decide where to start when describing this one of a kind gem. Let's start with her condition which is absolutely A-1 everywhere. Simply stated this boat looks more like a 2016 rather than a 2006. 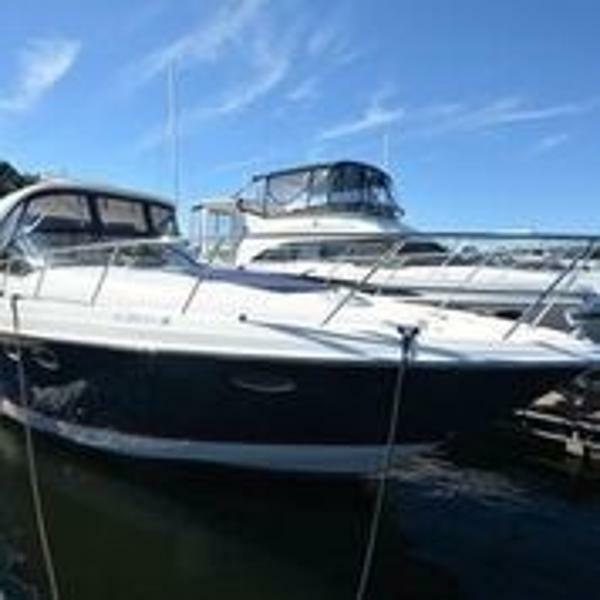 She has less than 265 hours on her MerCruiser 8.1L S HO (high output) 425 engines with fresh water cooling. Her Kohler generator has less than 300 hours and includes a sound shield. The engine room is clean with no signs of rust or corrosion. She even has twin cablemasters for the shore cords, plus, an engine room heater with thermostat. Her bow thruster coupled with the twin V drives gives you complete control around the dock in all conditions. She has a complete Raymarine electronics package including gps-chart plotter-radar, autopilot, stand alone depth finder, VHF radio and more. The list of cabin amenities is very long. Some of the highlights include a high end Fusion marine stereo with surround sound, 3 flat screen TV's, air and heat, vacu flush head systems (2 heads), pocket door privacy doors to both staterooms, cherry wood interior decor package, teak and holly salon and galley flooring, dinette with wood table that converts to a third sleeping area, central vac system and so much more! 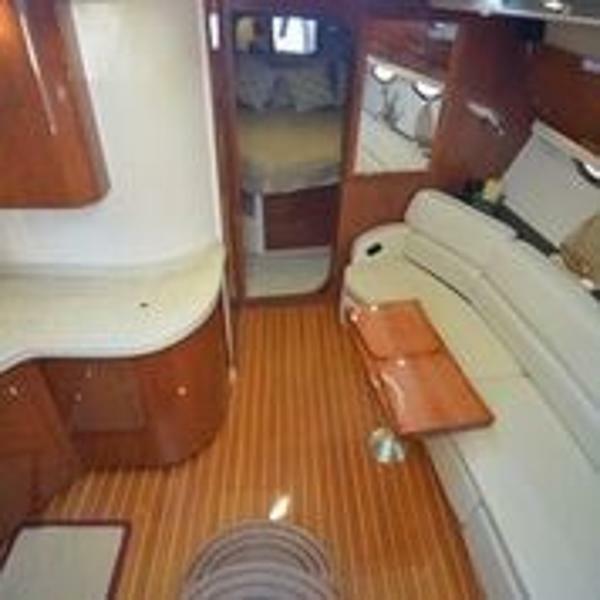 The cockpit has a great layout with tons of seating including a double wide helm seat with flip up thigh rise, port side crescent shaped seating with table (this area also converts to a sleeper), and large L shaped aft bench seat. There is storage below all of the seats. The cockpit wet bar has a refrigerator and large trash canister. 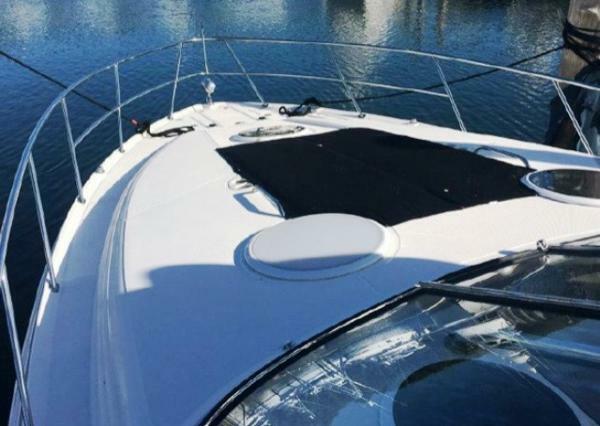 You access the bow via her walk through stainless steel windshield which gives you safe access to the windlass, forward deck sun pads (with covers of course), plus, line and fender handling. The boat sleeps six with the master stateroom forward. The private mid stateroom features twin beds that convert to a queen. The mid cabin also has a second head with separate vanity. Both staterooms have privacy doors. The head systems are vacu flush. The forward head has a circular stall shower. 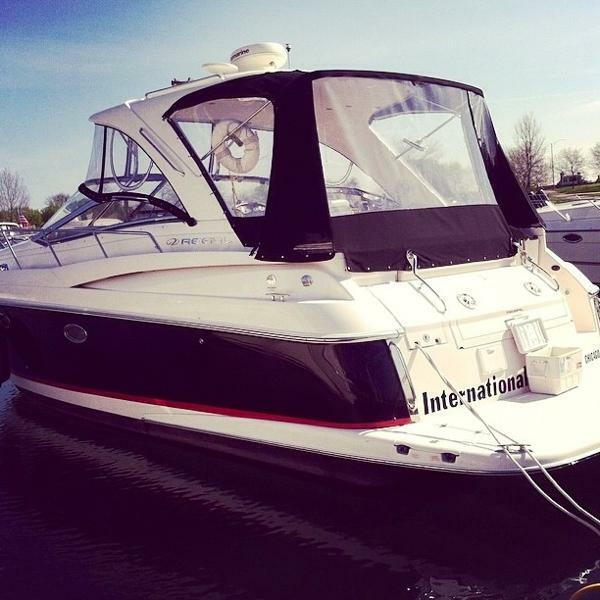 This boat has an incredible amount of room and storage throughout. To take a look at the detailed list of equipment please click on the Full Specs tab. Please be sure and watch the video also. NOTE-this boat is located offsite and is shown by appointment please. Please contact listing broker with questions or to schedule an appointment to take a look in person. Please do not wait, as, this boat will not last long. Thank you for your interest! 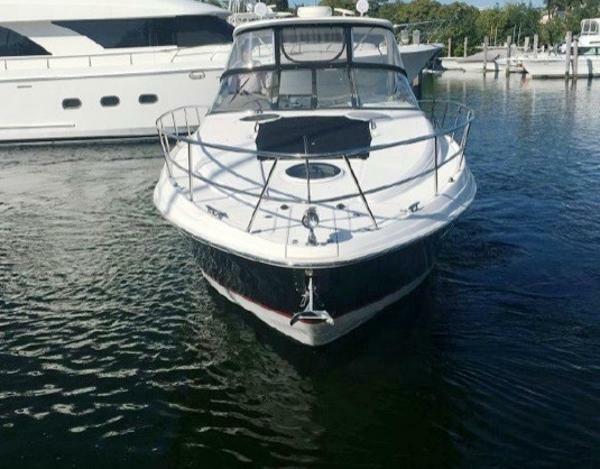 This boat is equipped with twin Mercruiser 8.1L HO FWC engines, Generator, custom two tone hull, cockpit cover, bow sunpad with cover, hardtop, oil change system, autopilot, ST60 depth finder, vacuflush heads, mid cabin tv, snap in carpet, anchor windlass, extended swim platform, 775 engine hours. 611 generator hours. Full Tune up done in July of 2018. Please call for items that need attention.